Adding fresh fruit to your tea creates a healthy and delicious treat! Temperatures are beginning to climb and customers will soon be looking for a delicious drink to help cool them off. 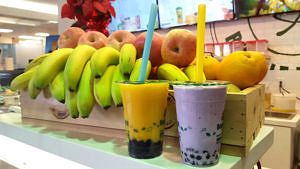 One option to offer to them is adding fresh fruit to their Bubble Tea. Fresh fruit can also be combined with a fruit syrup to enhance the taste. Additionally, since fruit is naturally sweet, customers do not need to add any extra sweetener. Combined with the various kinds of tea available, the amount of milk, and the choice of fruit, there is an enormous amount of combinations of Bubble Tea. 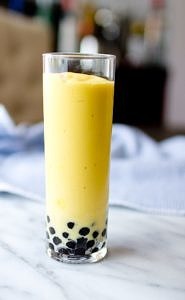 Real fruit Bubble Tea can be prepared by adding different fruit such as: strawberries, mangoes, watermelon, grapes, pineapple, bananas, honeydew, peach and more! Experimenting and adding fresh fruit to your Bubble Tea drinks will help you to continue to produce exciting and delicious flavors for your customers. You will be amazed at the assortment of drinks that can be created. Take pleasure in the upcoming season and enjoy! First, add all the ingredients into the blender except for the Tapioca Pearls. Next, blend the ingredients in a blender. Pour the ingredients over the Tapioca Pearls of your cup. Add Fresh Pieces of Mango on top and Seal your cup!